It’s a tale of the most frustrating thing about being a London local Locksmith. It’s a tale of something frustrating that happens on the job as a locksmith day in and day out. It’s a tale of something that is not helping the customer and not helping the genuine local London locksmith. 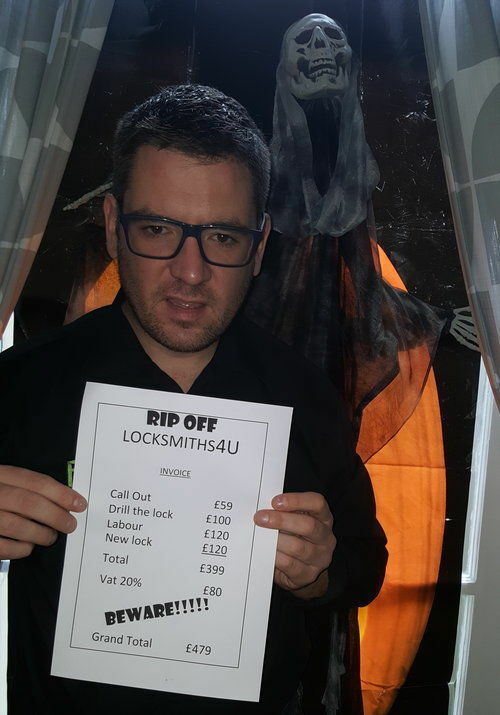 Being a Locksmith in London is to say the least a competitive business. There are so many locksmiths in London it is unreal. I would like to give you a figure but I can’t and there is a good reason why. The UK Locksmith industry is not regulated by the government. It’s crazy isn’t it! You would think that our safety and security would be a priority! So what does that mean to you the public? It means that…..
What can happen if you choose the wrong locksmith?? Lack of security for your home – ex cons could be fixing your locks! It is inevitable that the governments’ lack of concern and control over for the UK’s security industry will result in some pretty unfortunate circumstances. The problem for me as an MLA qualified, approved locksmith is that most people are unaware of the pitfalls in the industry and most people don’t realise how it affects them. So many people are easily lured by the temptation of a low quote and don’t realise the significance. Most people search online for locksmith near me and shop around for the best quote. A lot of people probably even search for cheap locksmith near me not realising the risks of calling a “cheap locksmith”. Choosing a cheap locksmith is risky business. This is a guide of how much you should pay for a locksmith. I do try to make customers aware that if they are being quoted a very low price that they can probably expect the price to increase on completion of the job and there is also a likelihood that the workmanship and materials may be below standard. A genuine locksmith will quote a fixed competitive price. There are too many occasions where a hard sell and a low price is just too tempting to refuse for customers. I have even had customers call me afterwards to tell me how they have been ripped off. The situation is very unfortunate as a whole. Those of us who are genuine locksmiths are losing work to less trustworthy locksmiths prepared to resort to unethical methods of gaining work. The general public are subject to a legal form of deception due to a lack of awareness of the dangers of choosing a dishonest locksmith. I have had the misfortune of seeing some of these underhand tactics first hand. I spent a short amount of time as an apprentice with a company, who I would not want to be associated with. They seemed genuine on the face of things, with an established high street premises in an affluent North London area but they had some very unorthodox quoting and advertising strategies which were shocking to me. Despite the difficulties that some of our more unsavoury competitors present, at IKS Locksmiths we pride ourselves on our honesty and integrity and will continue to offer competitive fixed prices for high quality workmanship and products. We can only hope to raise awareness of the unfortunate situation we have in the UK surrounding the governing of the security industry and the importance of choosing a local locksmith carefully. This is our guide to choosing a locksmith. I would be interested to know if you were aware the locksmith industry is unregulated by the government before reading this? I would also be interested know hear any locksmith stories you have? If you are wondering who is the best MLA approved mobile locksmith near me? Search here with your postcode for you local MLA locksmith http://www.locksmiths.co.uk/ and save their number in your phone so that you have it ready in an emergency. We are a 24/7 locksmith preventing burglary in North London. We fit high quality locks, bespoke security grilles and safes and offer a free security survey. We would be delighted to hear from you with any questions you may have. My next diary will be on the subject of some of the more positive and amusing aspects of being a local London Locksmith. In the meantime all comments and questions are very welcome.